(Nanowerk Spotlight) 'Smart' windows are expected to play a significant role in energy-efficient homes, ideally by generating energy themselves (see "Energy-generating smart window") but at least by allowing light in and keeping the heat out (in hot summers) or in (in cold winters). Vanadium dioxide (VO2) has long been recognized as a a material of significant technological interest for optics and electronics and a promising candidate for making 'smart' windows: it can transition from a transparent semiconductive state at low temperatures, allowing infrared radiation through, to an opaque metallic state at high temperatures, while still allowing visible light to get through. VO2 is best known in the materials world for its speedy and abrupt phase transition that essentially transforms the material from a metal to an insulator. The phase change takes place at about 68 degrees Celsius. So far, VO2 hasn't been considered to be particularly suited for large-scale practical smart-window applications due to its low luminous transmittance and solar modulating ability. Strategies to improve these properties, for instance through doping or composites, have resulted in trade-offs between the luminous transmittance and thermochromic properties. Researchers in China have now developed a process that can prepare VO2 thin-films with a controllable polymorph and morphology (including grain size and porosity). Their results show that with increased porosity and decreased optical constants the performance of the VO2 films is enhanced, leading to a higher transmittance of visible light and improved solar modulating ability. "The traditional methods for the preparation of VO2 thin films are gas-phase reactions, such as sputtering or chemical vapor deposition," Yanfeng Gao, a professor at the Shanghai Institute of Ceramics, Chinese Academy of Sciences (SICCAS), explains to Nanowerk. "These methods can grow VO2 with fine controlled thickness and homogeneity, however, low visible transmittance due to intrinsic absorption of VO2 and unacceptable solar energy modulation ability pose significant drawbacks. There are only very few reports on the chemical deposition of VO2 films using – for example – sol-gel process, but the quality of film is still not satisfactory. We are aiming to develop a process that can finally commercialize VO2. We selected our method to control the crystalline phase and morphology, and also optical properties." Gao and his team reported their findings in a recent edition of ACS Applied Materials & Interfaces ("Nanoporous Thermochromic VO2 Films with Low Optical Constants, Enhanced Luminous Transmittance and Thermochromic Properties"). This work supports a new means to fabricate large-area VO2 films and is an alternative process for mass production. 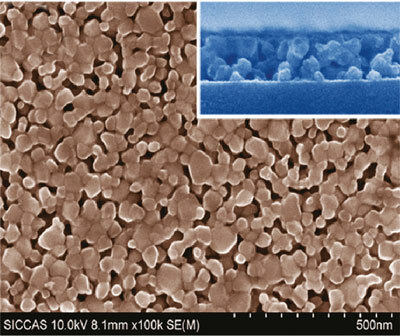 To prepare their nanoporous thermochromic VO2 films with low optical constants and tunable thicknesses, the team used a polymer-assisted deposition technique, resulting in single-layered VO2 films. "When we measured the spectral transmittance and reflectance of our VO2 films, we found that by increasing their porosity we could increase their solar modulating ability without decreasing the luminous transmittance," says Gao. "Another interesting phenomenon that we found is that the changes in luminous transmittance across the metal-insulator transitions (MIT) are thickness dependent. For thin-films, the visible transmittance at 20°C is generally lower than that at 90°C and, vice versa. However, the visible transmittance at 20°C for our 100 nm thick films exceeds that at 90°C." Experimenting with various thicknesses, the team found that the optimized thickness for films prepared by their technique to balance luminous transmittance and solar modulating ability is 100 nm. As Gao points out, a single-layer film of this thickness shows comparable luminous transmittance and solar modulating ability values to those of five-layered TiO2/VO2/TiO2/VO2/TiO2 films with optically optimized structures. "The change of the optical constants of VO2 across the MIT can effectively modulate the infrared transmittance and shift the position of the reflectance valley at 20°C, leading to a significant enhancement of the infrared modulating ability at a certain wavelength," says Gao. It is expected that VO2 thermochromic films will find special applications as a new generation of smart glass that can change infrared transmittance by responding to environmental temperature, while at the same time maintaining visible transparency. This kind of smart window might be especially useful for locations with hot summers and cold winters.